Hollywood brought one of its most iconic characters back home to Coronado Monday as film crews took over the main gate to Naval Air Station North Island. Actor Tom Cruise is revising his role as Navy pilot Pete "Maverick" Mitchell from the mega-hit movie "Top Gun" in a film expected out next year. On Monday, security was extremely tight as film crews set up outside the main gate to the naval military installation at 4th and Alameda. 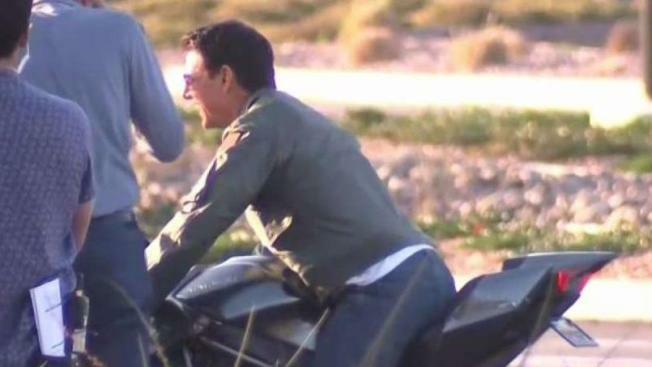 After hours on standby, an NBC 7 San Diego camera crew caught Cruise, flanked by security and production staff, as he jumped on a motorbike and let open the throttle. Cruise and his signature smile could only be seen for a few seconds before production staff put up a privacy tent that blocked the view of the set. The sequel first began filming in San Diego earlier this summer for just a few days. Filming took place at NAS North Island for a week, The Department of Defense and U.S. Navy confirmed for a previous article. Most locals can identify the San Diego streets and locations in the original 1986 film. The "You've Lost That Lovin' Feeling" scene was filmed at Kansas City Barbeque on Harbor Drive. Parts of Liberty Station, which was formerly the site of Naval Training Center San Diego from 1923 to 1997, served as a backdrop for the original movie. Navy property on Point Loma and a stretch of Oceanside can also be seen in the original film.